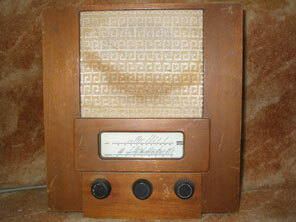 This receiver is also model SAD94L, but as can be seen is housed in a wooden cabinet. 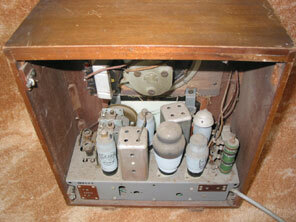 The same chassis is used as the bakelite set seen on the previous page, and also the same knobs and card back etc. However this version of the SAD94L is much rarer than the bakelite version. As so often happens that does not make it more valuable, since the wooden cabinet is quite plain, whereas the bakelite cabinet is both distinctive and attractive, and hence more desirable to the Art Deco collector. In fact the cabinet design shown on this page is actually rather old fashioned really, and with the wooden "apron" beneath the tuning scale and surrounding the knobs, it appears to hark back to receivers like the A26 from 1935. Although I don't know the designer of this set for sure, I think it would be safe to assume the R.D. Russell had a major part to play, if not the designer himself then certainly the influence. Similarities are also evident with the Wartime Wartime Receiver, the layout and size of the cabinet is nearly the same. Murphy designers were chiefly responsible for the design of the Wartime Civilian Receiver so it is not surprising that the same ideas also appeared within the Murphy range. The wooden version of the SAD94L is not even mentioned in the valuation booklets provided by Murphy Radio in the late 1940s, so coupled with their relative scarcity today one must presume that very few of these sets ever made it into production. You can see by the level of dust in the example pictured that this set has not been worked on for decades, and hence is all original. Valve line-up is TH233, VP133, HL133DD, PEN383, U403.